↑ Fernández Duro, Cesáreo (1972). Armada Española desde la Unión de los Reinos de Castilla y Aragón. Museo Naval de Madrid, Instituto de Historia y Cultura Naval, Tomo III, Capítulo III. Madrid. ↑ J. H. Parry, 'Colonial Development and International Rivalries Outside Europe, 1: America', in R. B. Wernham (ed. ), The New Cambridge Modern History, Vol. III: 'The Counter-Reformation and Price Revolution 1559—1610' (Cambridge: Cambridge University Press, 1971): 507-31. 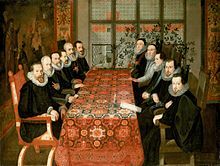 ↑ R. B. Wernham, «Queen Elizabeth and the Portugal Expedition of 1589: Part I» The English Historical Review 66.258 (January 1951), pp. 1-26; «Part II» The English Historical Review 66.259 (April 1951), pp. 194—218. Wernham’s articles are based on his work editing Calendar State Papers Foreign: eliz. xxiii (January-June 1589). ↑ Helmut Pemsel, Atlas of Naval Warfare: An Atlas and Chronology of Conflict at Sea from Earliest Times to the Present Day, translated by D. G. Smith (London: Arms and Armour Press, 1977). ↑ R. B. Wernham, 'Queen Elizabeth and the Portugal Expedition of 1589: Part II', English Historical Review, 66/259 (April 1951), p. 204. ↑ Wernham, 'Part II', 214, 210-11. ↑ Wernham, 'Part II', 210-11. ↑ Wernham, 'Part II', 214. ↑ John A. Wagner, Historical Dictionary of the Elizabethan World: Britain, Ireland, Europe, and America (New York: Checkmark Books, 2002), p. 242. ↑ Tenace 2003, pp. 855—882. ↑ oca, Fernando Martínez Laínez y José María Sánchez de. Tercios de España la infantería legendaria. — 5a. — Madrid : Edaf, 2006. — ISBN 9788441418479. Geoffrey Parker, 'The Dreadnought Revolution of Tudor England', Mariner’s Mirror, 82 (1996): 269—300.